Randy and I both were raised with hunting in our lives. He primarily deer, turkey, and rabbit hunted, his grandfather raised some of the best coonhounds and later foxhounds to compete with. My family, my dad had english setters and a pointer from time to time, and my grandfather raced a coonhound/greyhound cross and was very successful at that. Randy also team roped and liked being around and riding horses, I did too, but was not as confident in riding for sure. We have found a way to include both horseback riding and working dogs together. We have also found several friends along the way! We have had also been lucky enough to have wonderful friends and trainers in Keith and Robbi Gulledge of Blue Dawn Kennel who have helped us to many wins and titles. We finished our first FC/AFC Sundance's Hearts are Wild who we purchased as a green broke dog from Ken Chenoweth, and since have had 6 FC's, NFC, NSDC Rup, 2 Reg. 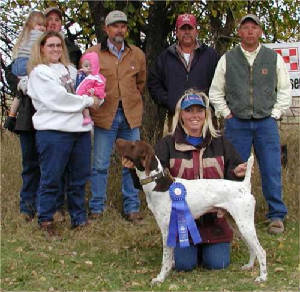 Ch., 3 Reg.Ch runner ups, Species Ch, Species Ch. Runner Up, breeders of a Futurity winner, and a derby classic win. Magnum produced a FC, Reg. Ch, and derby classic winners that we are proud of, as well as the NSTRA champions and those close to various titles that we are excited about! If you are looking for a puppy, stud dog, or started dog, let us know, if we don't have what you are looking for, we will sure help you find it.